While they once roamed most of the United States and Canada, the birds were essentially wiped out by the early 1900s, as hungry settlers hunted the birds for dinner and land was cleared to make way for agricultural land and cities. Through reintroduction programs started in the 1940s, mostly by hunters, their numbers began to climb again, setting the stage for what was perhaps an inevitable showdown: farmers versus wild turkeys. 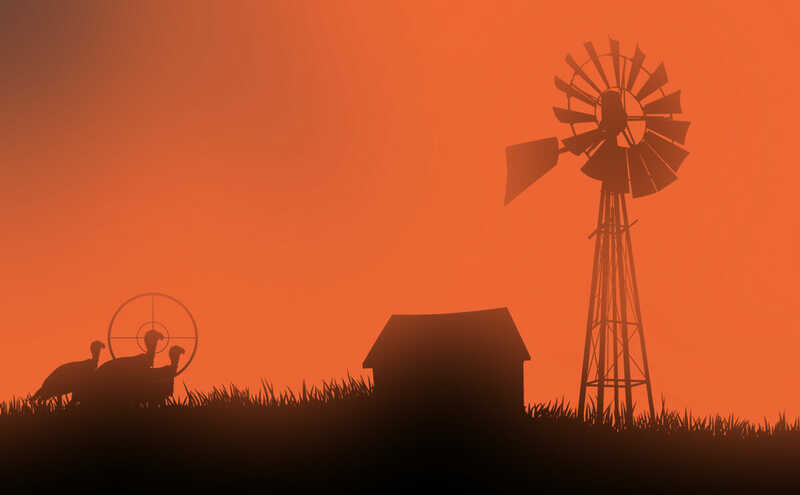 Depending on who you ask, the birds are either marauding, wily animals that ruin crops and contaminate cattle feed as they roam across farmland in huge packs. Or they’re gorgeous, sensitive birds that are a delight to hunt and unfairly blamed for crop damage inflicted by deer and raccoons. Everyone does agree on one thing: numbers of wild turkeys are increasing in many parts of North America, from Ontario, where they’ve gobbled grapes off entire vineyards, to Staten Island, NY. And it’s making farmers nervous. Depending on who you ask, the birds are either marauding, wily animals that ruin crops and contaminate cattle feed as they roam across farmland in huge packs. Or they’re gorgeous, sensitive birds that are a delight to hunt and unfairly blamed for crop damage inflicted by deer and raccoons. “The turkeys are doing damage, there’s no doubt about that,” says Maine Farm Bureau executive secretary Jon Olson, who recently testified in favor of a bill expanding that state’s turkey hunt. To kickstart a hunting season on the birds in the late 1970s, Maine’s inland fisheries and wildlife department trapped 41 wild turkeys in Vermont and set them loose in two counties. Their population has since boomed to between 50,000 and 60,000. Olson says he’s heard myriad horror stories from farmers, including a dairy farmer whose plastic-wrapped hay rotted after being pecked, a vegetable farmer who saw turkeys eat all the emerging shoots of his oat field, and one potato grower who saw wild turkeys dig up and destroy a field of freshly planted potato seed. 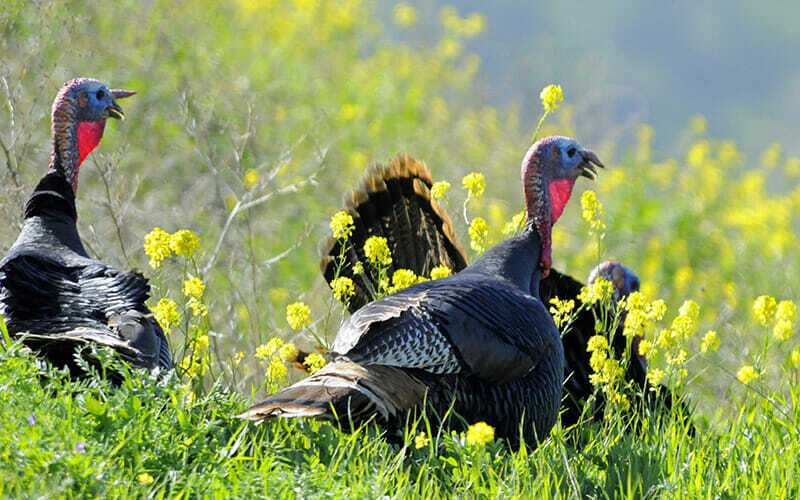 Wild turkeys in a field of mustard flowers. As a result, Allen says his department tries to bend over backwards to accommodate aggrieved farmers. While he thinks the issues are a bit overstated, he says that “doesn’t mean they’re not legitimate.” He also says the birds are sometimes unfairly scapegoated. And he’s not the only one who thinks so. Turkey troubles have farmers up in arms, but researchers say the bird is getting a bad rap. In an oft-quoted 2004 study from Indiana’s Purdue University, researchers equipped white-tailed deer, raccoons and wild turkeys with tracking devices and monitored fields for two years. Those researchers concluded that the birds, which feed in the daytime, will show up at the scene of an overnight crime committed by a deer or a raccoon and be unfairly blamed. Janice Gardner, who studied the relationship between Maine blueberry farmers and the birds for her 2009 Master’s thesis, says she has more of a nuanced perspective. “Oh yeah. They eat blueberries, there’s no doubt about that,” she says. The trick, according to her, is communicating to farmers how little damage turkeys do, at least relative to other animals and to the total crops they could potentially eat. For her study, Huebert tracked numbers of birds she saw in fields and the size of the field. Extrapolating that with the energy requirements for a wild turkey, she concluded that on a 20-hectare field wild turkeys were eating 18.7 kilograms, or about $30 worth, of blueberries, totaling a 0.5 per cent crop loss. Correction: A previous version of this story incorrectly identified Janice Gardner by her maiden name.